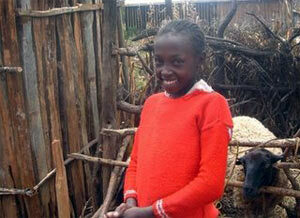 At 11, Kinya knows how important an education is for her future because she is growing up where there often isn’t one. One day I received a letter from Kinya that changed both of our lives. She wrote, ìI’m now at a new school Ö This is because we moved after eviction. I’m still working hard.î I knew that Kinya, her mom and two older brothers were squatters on government land at the foot of Mount Kenya, but this word, eviction, caught me by surprise. It is obvious that Kinya is loved deeply by her mom. Kinya is a joyous child. She is a good story teller. She shares her life with me in every letter that she writes. Her stories bring us together and build the bonds of our friendship. So when I heard that word eviction, I knew I had to help her. I chose to sponsor Kinya because she is being raised by a single mother who struggles to put food on the table and pay rent because she can find occasional odd jobs. I know the challenges of being a single mom because I am one, too. Thus, I feel compelled to help another woman and mother in less fortunate circumstances provide the most basic needs of food and shelter for her family. I have been painting with watercolors for years. I never considered marketing or selling my art until trying to figure out a way to help Kinya. I finally realized that I could use my God-given talent to help my friend. For more than two years I have been on a mission to sell my paintings. Along the way, I won the right to call myself an artist. I send the proceeds from my art sales to help Kinya’s family. Last April Kinyaís family was able to purchase half an acre of fertile, productive farm land. 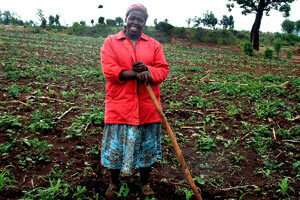 Kinya’s mom, Ann, immediately planted row after row of corn and potatoes to take advantage of the pending rainy season. Ann proved to be hard-working and industrious. Along the way, she proudly rose to the role of provider. While weeding with a hoe in hand, Ann beams in the photos I received from Project Timau. Annís smile demonstrates her strength to overcome adversity when given the opportunity. It shows she believes her family has a future. So, Kinya’s house was built. Ann’s first crops were harvested. And, Kinya’s family bought two sheep because they were able to feed themselves and generate enough income by laboring on their own land. Along the way, Kinya found comfort and a safe haven from eviction. ìAt last I’m enjoying rains in a nice house that doesn’t leak. Thanks a lot for making my life happy Ö You are part of my life, I cherish your care.î Once again, I received another letter from Kinya that changed my life. It feels wonderful to be an artist, to help another single mom and to be cherished by Kinya! You can see Marcia’s paintings by visiting her Web site, watercolorsforacause.org. What a blessing to make a difference in Kinya’s and Ann’s lives! …and create such wonderful art in the process! grateful for the opportunity to have a water color painting. You did a super job. Shariing your talents to help others. Marcia….I loved reading your blog about Kinya and Ann. Your email was forwarded to me by my friend Pamela White. I, too, sponsor a child in Kenya through CFCA and find it to be just the best organization. I am so impressed with your industriousness in selling your paintings for such a great cause.